@Nokia_Connects has loaned me a Nokia Lumia 920 to try out for a couple weeks. Here are my initial impressions. Warning, I’m not a Windows user. My desktop OS in Ubuntu Linux and I use an Android phone. But I was curious to try the Lumia to see what Windows Phone 8 was like and whether I could use it productively without a Windows PC. 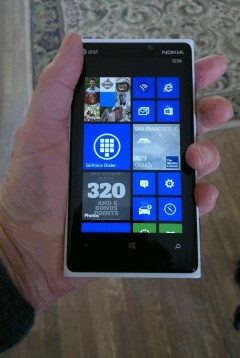 Physically the Lumia 920 looks a lot like a larger version of the N9 or Lumia 900. The screen even curves down into the sides of the body like the N9. My Lumia is white and the hard polycarbonate body has a smooth polished surface that looks great. It looks slippery but it’s not. The smoothly rounded sides fit securely and comfortably between the palm of my hand and my curved fingers and I never felt in any danger of dropping the phone. The Lumia 920 has a minimum of exterior ports and buttons. There’s a 3.5 mm headphone jack, and slide out micro-SIM tray on top and a micro-USB charging and connectivity port on the bottom. There’s nothing on the left side. The right side has three buttons: top to bottom they are the volume rocker, power-lock/un-lock button and a dedicated camera button. Except for the slide out SIM tray there are no visible seams or gaps any where on the phone. The 2000 mAh battery is not user replaceable and the Lumia, which has 32 GB of internal storage memory, doesn’t support memory cards. The Lumia’s 4.5 inch 1280 x 768 px IPS screen is one the best I’ve seen on any phone. Blacks are really black and whites are pure and bright. Colors are well saturated and accurate. The screen has a wide viewing angle, colors and detail hold up well when viewing the screen at an angle. The screen also performs really well in bright sunlight. The phone really cranks up the brightness in bright situationsand there seems to be some sort of very effective anti-reflective coating at work as well. As I mentioned I don’t use any Microsoft software or hardware. Until I got the Lumia I’d only spent a few minutes playing with Windows Phone. I expected to hate the Windows Phone OS but ended up enjoying the experience for the most part. High points were the the OS’ stability and the responsiveness of the user interface. Transitions between screens and apps are very snappy and animations are buttery smooth. The Windows Phone 8 user interface is refreshing different from Android, Symbian, iOS or anything else. The main UI element is the Live Tile, which can be a shortcut to an app or file or an animated widget displaying things like the current weather, upcoming calendar events or a slideshow of photos from your gallery. Tiles can be moved and every tile can be re-sized to fit into a 1×1, 4×4 and 4×8 matrix. Although the interface is different then anything I was used to, it has the apparent simplicity and intuitiveness that are the mark of good user interface design. I was able to get up to speed with the basics of calling, messaging, email and the camera in just a few minutes without needing to look at the 16 page quick start guide, which is the only documentation packed with the phone. I’m a T-Mobile user and the loaner Lumia was locked to AT&T. I’m using a SIM from Red Pocket Mobile, an AT&T prepaid MVNO. Red Pocket uses different APNs than AT&T for data and MMS. Both APNs use a proxy. Unlike with WP7, iOS and Symbian Belle, all of which hide or disable the MMS APN, I was a able to easily enter all the required settings. AT&T doesn’t allow their pay as you go or MVNO customers to use their LTE network so I couldn’t test the Lumia’s LTE speeds. Using HSPA+, the Lumia 920 generally achieved data speeds of a little better than 6 Mbps down and 1 Mbps up. In contrast to the openness of its APN settings, just about everything else about Windows Phone seems tightly locked down. Unlike with Android or Symbian the only way to install apps is through the Windows Store. There’s no side loading and there aren’t any alternate app stores. There’s also very limited access to the phone’s file system. There is no pre-installed file explorer and none is available in the Windows Store. Third party apps can create and save files in their own private area of the file system but the only way to share files between apps seems with SkyDrive or other cloud storage. Press sign in and you are done. In less than a minute I had all my email, contacts and calendar on my Lumia with real time push sync. It works great and the WP8 Email app does a decent job with Gmail. Unfortunately, Google is shutting down their Exchange service to new users on January 30, 2012. Current users will be able to keep using Exchange on their current device, but after Jan. 30 new Windows Phone users will not be able to sync Google Calendar and Contacts. Gmail will still sync if you set it up as an IMAP account but it will use polling rather than push. The ability to download any file from Dropbox, save it on the phone and let me open it with the phone’s default app for that file type; Office for text files, Gallery for images and Media Player for music and videos. For plain text files, regardless of their I file extension (.html, .css, .js, .php, etc.) I need to be able to edit the local copy and save the changes back to Dropbox. Hopefully I’ll find a Dropbox app that will let me do what I want. If you know of one please let me know in a comment. This entry was posted in Devices and tagged Linux, Lumia920, Windows Phone by Dennis Bournique. Bookmark the permalink. I no longer have a Windows Phone but the Lumaa 920 worked for me as a MTP device in Ubuntu 10.04. See A Linux User’s Nokia Lumia 920 Review – Part 3: Transferring Files Between Windows Phone 8 and Ubuntu for details of what worked (video trnasfer did) and what didn’t. Mate, Lumia 920 has 32 GB of storage not 32 MB. ;) Mistake. How do you manage files between Ubuntu and Android? My primary OS is Ubuntu 12.04 and I have a Galaxy Nexus, how to transfer files between them, using the datacable doesnt work. SO I use Airdroid. I’ve corrected the MB typo, thanks for pointing it out. The Galaxy Nexus and the Lumia uses MTP for PC USB connectivity. I installed several MTP packages on my Ubuntu 10.04 LTS system and USB file transfer works for me with a Nexus S (which also uses MTP) and worked with the Lumia when I had it. Try searching for ‘mtp’ in Synaptic and installing whatever it finds.